In this issue we see the magnetism between romanticism and technology, rawness and modernity, mysticism and authenticity. It is a romantic daydream where the unusual, raw, and authentic mingle with poetry and technology to bring about the transformation of an idea into a well-designed product. This month you can find the perfect components to create your collections from the yarns to the designs, fabrics, leathers, and all the trim. Get inspired with the April edition! 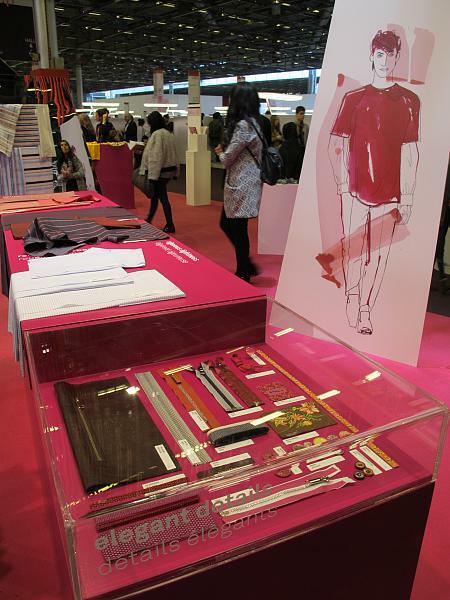 Paris — Première Vision Paris is now the home of six complementary trade shows: Yarns, Designs, Fabrics, Leather, Accessories, and Manufacturing. It is only logical to cross-market these events. In this gallery see an area in the fabric show that brings together a synergistic collaboration between PV Fabrics and PV Accessories showing the harmonies of textiles, accessories, trim, and finishing for 2017. Paris — Sometimes it is possible to overlook how the little things can make a big difference, but not here. Trendease spent some time in Paris looking at hundreds of the latest trims and brings you the highlights here from Première Vision Accessories, once referred to as Mod-Amont. See the driving trends and learn about key exhibitors. Paris — Magnificent flowers, overly-radiant, powerful fragrances, wild and mystical romanticism. Created by the spirit world, under shamanic influence, colors and materials become one, violent and bewitching. Materials are rich and swollen with sap, gleaming and voluminous. Materials are wild and full. Summer suede, bird feathers, matt reptiles, wrinkled buffalo. Paris — The Spring-Summer 2017 season for leather and fur: An Ode to (Particular) Beauty. The 1950s and 1970s combine, creating a borderline aesthetic. A joyfully shabbiness, where plastic and PVC are hyper-luxurious, where that crumpled vinyl of an indefinable color is in fact dipped lamb... Acidic, artificial and assonant colors, blended in a milk-shake. Paris — “Beauty will be convulsive or will not be at all” - André Breton. Upsetting, malevolent, frightening flowers. A deconstructed, aggressive, iconoclastic, sleazy, ambiguous, imperfect beauty. Shattered, deformed, shaken, mistreated, lacerated materials. Colors that go against the grain, dissonant, paradoxical, chaotic: wonky yellow, raucous pink, fighting green, transgender blue. Paris — An evanescent, unstable beauty, ready to disappear in a cloud of sand. Flowers exist in suspended animation, a sublime moment between magnificence and disappearance. It brings to mind the naïve primitives of Miquel Barcelò, the outlines of the flowers drawn in charcoal, and the impossible bouquets of Herman De Vries. Materials are crumbly, unstable, soft to the touch or slightly granular, sandy. Paris — Première Vision Designs, formerly known as Indigo, presents its design directions for prints, patterns, and motifs for the Spring-Summer 2017 season. Playing with proportions, with chance, it invites experimentation and sequential discovery through multiple readings and layers. See the unique display of art and directions to help steer collections. Paris — Once called Expofil and now operating under the name Première Vision Yarns, we explore the yarn directions for Autumn-Winter 17/18 that will one day weave and knit their way into the fashions of tomorrow. What blends, twists, and wraps can you imagine in today’s fast-paced and innovative world of wonders? Paris — Milan is on the doorstep, but before the grand entry, let us take a look at some of the works from the finest contemporary craftsmen and women in France. After all, such pieces are in high-demand these days, homage to the human touch and skillset embodied within. Subscribers can see over 100 carefully crafted items here within.